the world's most popular UV sterilizers for residential and light commercial applications! UVMax by Viqua is the most widely-used brand of residential and light commercial UV systems in the world. Viqua's parent company, Trojan Technologies, is a pioneer and world leader in UV water disinfection. UVMax is the brand that all others try to imitate. 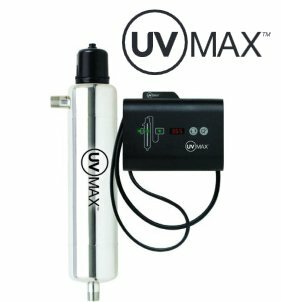 The UVMax product line features a wide range of models from basic residential systems to sophisticated models with all the bells and whistles capable of flow rates of more than 50 gallons per minute. Below, you will find our full selection of Viqua products powered by UVMax organized by flow rate. If you would like assistance selecting the best UV sterilizer for your needs, please call us toll free at 1-866-376-2690.
compact with high capacity for commercial applications - 2 year lamp life! * based on UV dose of 40 mJ/cm2 at 95% UV transmittance (UVT). UVT is a measure of the clarity of your water and the ability to pass UV light through it. 95% UVT should be considered rather ideal. If your UVT is less than 95% or you are unsure of your UV transmittance (i.e. it has not been tested), we recommend that you choose a UV unit with roughly 2 times the flow rate capacity that you need (this equates to a UVT level of about 70-75%). This will ensure that your water will be safely disinfected in the event that your UV transmittance is less than optimal. If your UVT is known to be less than 75% or your source water is highly colored or cloudy, please call us for pre-treatment and sizing assistance (toll free 1-866-376-2690).